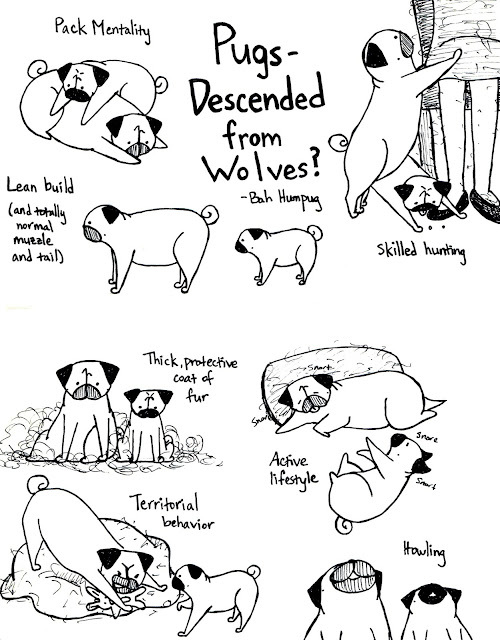 Bah Humpug: Pugs - Descended From Wolves? Domesticated dogs have come a long way from their wolf ancestors. This is probably more evident in pugs with their unusual physical features. Whenever I spend a ton of time or money on my dogs, I often think to myself about how far they've come from their ancestors and how they wouldn't stand a chance living in the wild without a human to take care of them and pamper them. cute! yeah, they totally could not survive in the wild now! haha. I think it's hysterical that my 6-month-old Puglet, Apollo, howls more convincingly than any of my other 8 rescues (including the beagles and the Siberian ). My pug came to us as a stray. Jumped up against my roommate's daughter's car at a stop sign. When she opened the door to see if she had hit the pug, he just jumped in the car. Don't know how long he had been a stray, but to this day he is still terrified of abandonment. Wonderful dog. But what did he know about surviving outside a home? Nothing.